Waffles in the shape of keyboards, security cameras, and remotes were served at the Las Vegas event. Logitech didn’t have anything new to unveil at the Consumer Electronics Show in Las Vegas this year, so it decided to offer attendees waffle versions of the products it already sells. The campaign team began planning for this year's CES in July 2017. The idea of a food truck serving up "LogiTreats" - which was first brought to the table by Praytell - was finalized in October 2017. "The idea was that, if we could get people to wait in line and grab one of those LogiTreats, it would give us a chance to really have a strong engagement with them and encourage them to share content online," explained Krista Todd, Logitech’s VP of global communications. In late December and early January, Finn Partners pitched #LogiTreats to journalists attending CES and invited them to stop by the truck, which helped drive buzz prior to the event. 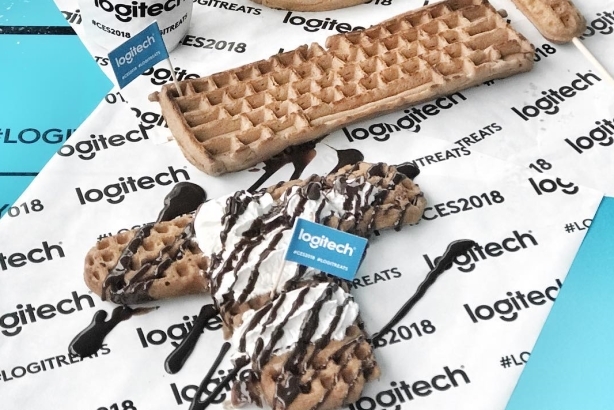 Beginning on January 9, the #LogiTreats truck served up free waffles in the shape of Logitech products, such as a keyboard; Logitech Circle 2, which is a security camera; and the Logitech Spotlight remote, which is a presentation device. A coffee station accompanied the truck in an outdoor booth space at the Las Vegas Convention Center. "We used a user-generated content tool to pull in our content and all content using the hashtag #LogiTreats," said Todd. "We had a big monitor at the truck, where visitors could see all the hashtag content across social channels." In addition, the brand launched a social contest where people could share #LogiTreats and #CES2018 in posts on Twitter and Instagram for a chance to win free Logitech gear. Fans at home could enter the contest by retweeting branded posts. "We gave out products for each hour of the four days of the convention," added Todd. "This helped drive people to come back to the booth." The brand also tapped six local influencers to create content and drive social traffic during the show, including LasVegasFoodie and EatMeLasVegas.
? ?GIVEAWAY TIME?? @Lasvegasfoodie has partnered with @logitech and @stickyiggys for a giveaway! A ?? Logitech Keys-To-Go Keyboard to celebrate their #Logitreats at #CES2018! Perfect for any social butterfly ?? on the go! Rules???? 1?? Like this photo ♥? 2?? Follow me and follow @logitech (I check!??) 3?? Tag a friend and comment why you need a Keys-To- Go Keyboard 4?? *BONUS* Repost this photo for TWO extra entries (make sure to tag #logitreats and @lasvegasfoodie) ? ?I’ll be checking you followed the rules! ? ?Giveaway will close Thursday 1/11 •? ?GOOD LUCK!!!?? • ——————————- ?? If you’re not going to the show, you can still participate and win prizes on their Twitter @Logitech ! Within the first day, Logitech had already gained attention as one of the top brands at CES and #LogiTreats was a top hashtag alongside #CES2018. There were around 621,000 tweets including #CES2018 for the show and, of those, #LogiTreats ranked 7th in overall volume and was one of only three mentioned brands. The campaign generated a social engagement of about 80,000, measured through shares, likes, retweets, and favorites. Logitech’s activation was featured in a BizBash slideshow roundup of 21 must-see highlights from CES 2018.